The Mândra is a small and relatively light knife suitable for belt or neck carry. 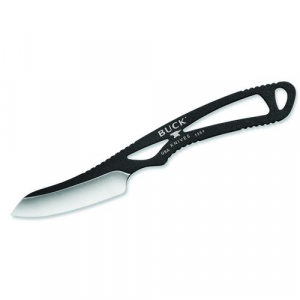 Made of quality materials, it is a perfect companion blade for a larger camp knife or an option with Old World appeal for a backpacker or outdoors enthusiast seeking fixed blade utility for modest chores. It has a gorgeous design that was executed with minor cosmetic imperfections. The Mândra (which means “proud” in Romanian) is a small fixed blade knife produced by Helle, a Norwegian knife maker founded in 1932 by Steinar and Sigmund Helle. 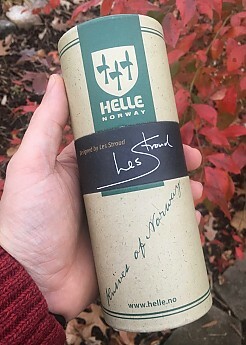 The knife was designed in collaboration with Helle’s Anders Haglund by Les Stroud, a Canadian survival expert, filmmaker, and musician best known as television’s “Survivorman.” As Helle’s Mândra page reveals, the knife has an interesting history, having been tested in prototype while Stroud was on location filming an episode of his show and refined accordingly based on Stroud’s experiences and recommendations. 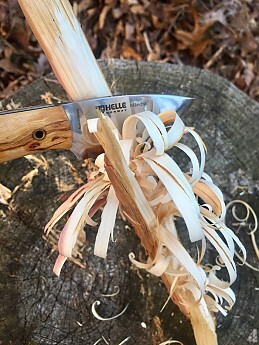 Helle has a reputation for producing higher end knives that feature quality materials and attention to detail over more fully automated mass production. In the case of the Mândra, this means that the knife is made with Arctic Curly Birch handle scales set off by a black, “vulcan fibre” liner. The blade is full tang (it runs the full length of the knife) and made of Helle’s triple laminated steel—twin layers of 18/8 stainless steel (for strength and corrosion resistance) sandwiched around a core of high carbon steel that provides an exceptionally keen cutting edge. 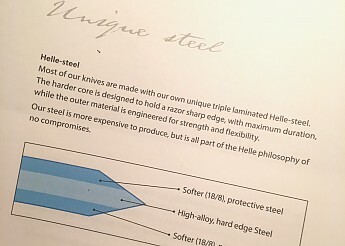 See a snapshot of Helle's explanation of the steel from the owner's guide, below. The sheath is of double-stitched tanned leather treated with what Helle terms "saddle grease" and closed with an antique brass finished snap. 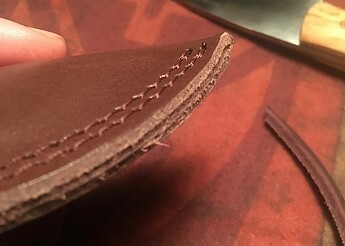 Not to fear: there isn't anything greasy about the sheath; it has simply been conditioned with some sort of typical leather conditioner and protectant. The design of the knife is somewhat unique, featuring a slight drop point top edge that meets the deep belly of the cutting edge. Because the blade is relatively short—2.56 in/6.5 cm, with a 2.36 in/6 cm cutting edge—and high—1.19 in/3.03 cm at its widest point—it looks a bit like an asymmetrical spear point, giving it its characteristic appearance. The blade itself is a slim .1 in/2.5 mm wide. The blade is finished with a Scandinavian grind, a single sharpened bevel that results in a fine, thin edge perfect for carving tasks (though it can be less durable than other grinds, too). The laminated steel construction can be seen in the Scandi grind, below, revealed by the difference between the lighter colored 18/8 stainless on the high end of the grind and the darker high carbon steel that tapers to the edge. 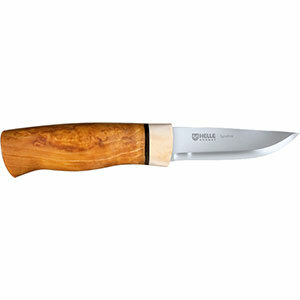 The total length of the knife is 5.87 in/14.9 cm, of which 3.15 in/8 cm is handle. This means the knife is intended to be used in a three-finger grip as opposed to a full-hand grip. I have relatively large hands, but I found the three-finger grip satisfactory for most tasks. 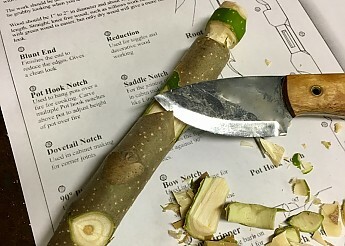 The size of the knife means that it would be an ideal companion knife to a larger blade—it can be readily accessed to cut cordage, prepare kindling, or open a dehydrated meal pouch, but it is not scaled to handle larger camp knife tasks. Two brass tubes pierce the blade and scales; the larger, at .25 in/.64 cm, serves as a lanyard hole should one wish to add a lanyard to the diminutive blade (it readily accommodates paracord). The Mândra weighs in at 2.36 oz/67 g. The leather sheath and cord add another 1.66 oz/47 g. This is a relatively light knife and sheath combination, readily carried as a neck knife. 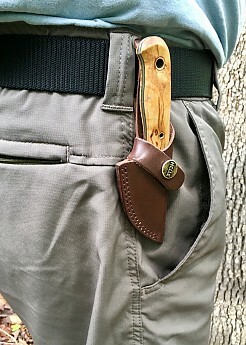 Not surprisingly, the sheath is designed for either belt carry (it has a loop) or neck carry. A generous length of leather lacing is provided to run through the loop as a neck cord. 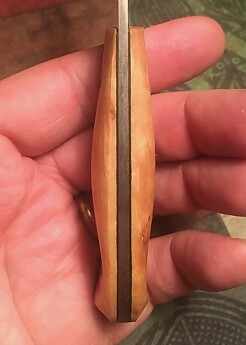 In practice, I favored either a simple pocket carry (the snap renders the blade secure in the sheath) or, with the addition of my own cord lock, neck carry. In the realm of initial quality, I was a bit surprised. Priced by a popular online retailer, the Mândra goes for USD $189, but the fit and finish of my sample were lackluster. Yes, it came beautifully packaged. 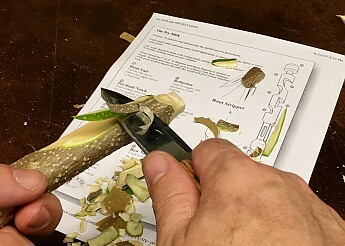 An elegant tube opened to reveal the knife and its owner's guide, its sheath, a piece of leather lacing for neck carry, and a neat little cloth for polishing the blade. Kudos, Helle, on presentation that makes the owner feels special. There is no skimping here—the cloth subtly suggests that this knife is worthy of its owner's care. The curly birch is an innately beautiful wood, and the black vulcan fibre liners offset the wood from the steel beautifully. Closer inspection revealed some issues, all of which were cosmetic, but nevertheless problematic in a knife at this lofty price point. Hollow brass tubes, a classic and classy choice, are used as pins to help secure the knife scales to the blade. On one side of the knife they are smoothed down, even with the wood—no problem. But on the other side, the interior of the tubes appears to have been flared unevenly. The resulting mangled appearance seems amateurish, as though someone rushed this stage of production (note oddly shaped lanyard tube in image, below). A second issue appeared when I viewed the handle from the top. The left handle scale is sanded down much more than the righthand one, producing a visible asymmetry (see below). Again, this seems problematic given Helle’s reputation and the Mândra’s price point and it spoils what would have been a beautiful, symmetrical effect of the "Coke-bottle" handle. Lastly, the spine of the knife blade was slightly unevenly ground (note where light catches spine in image, below). While this is nitpicky, this cosmetic imperfection—combined with those mentioned previously—seems curious at this price point. I reiterate that these are cosmetic concerns. They in no way impair the utility of the knife. 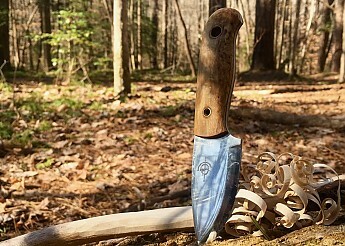 Nevertheless, as one might be drawn to such a knife for aesthetic as well as functional reasons, they are worth noting: part of the charm of a traditional Scandinavian knife is, after all, its aesthetics. The sheath is well made and functioned perfectly during my months of testing. The seams are double stitched, and the leather is of good quality. 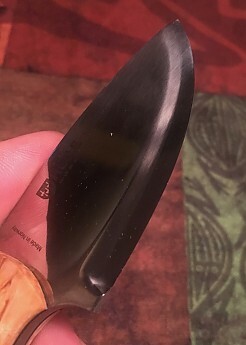 Although the edges of the sheath have not been burnished, a nice touch that is included is a plastic liner that protects the leather from the knife’s edge. Knife retention is non-existent without the strap, but the knife is very secure with the strap snapped closed. 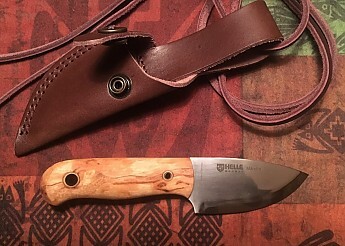 Had the sheath held the knife in a tension fit without the strap, it would have been a bonus, but I do not view the looseness of the unstrapped knife in the sheath as a negative given the secure and serviceable strap. For the past six months, I have tested the Mândra in a variety of circumstances. 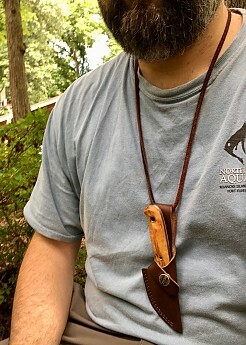 The weather has run the gamut from sub-freezing temps to 90˚ F/32.3˚ C. I have had the Mândra out in sun and rain (although, owing to the leather sheath, I was circumspect about not getting the sheath unnecessarily soaked). I have worn and used it about my house and yard repeatedly, too many times to count. It has opened packages, cut cord, trimmed pork tenderloins, sliced tomatoes, diced onions, and more. I watched as my use gradually caused the Helle and Survivorman logos to fade and all but disappear. I have also used it in the field, taking it with me on numerous trips to such places as Hanging Rock State Park and the Birkhead Mountains Wilderness of North Carolina. It has been worn as a neck knife or a belt knife, and it has ridden in my pocket and in my pack. In the backcountry it served to baton small wood for fire starting, to make feather sticks for the same purpose, to slice food I cooked, to cut cordage for my tarp tie-outs, to carve notches in wood, and, again, much more. I have used it and at times even abused it a little, resorting once to batoning the knife through a stick with a piece of hard quartz rock in the absence of a suitable piece of wood. First and foremost, the Mândra holds an excellent edge. 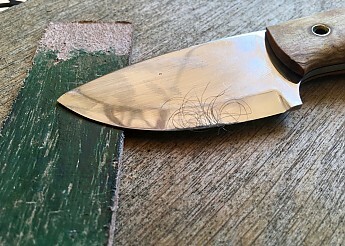 Time and again, stropping the Mândra on a piece of stropping compound-impregnated leather was all it took to restore a shaving sharp edge to the knife after use. And I do mean shaving sharp: yes, those are hairs from my arm when I tested the blade’s sharpness. Note how effortlessly the Mândra slices paper, an indication that the edge is free of micro-chips or other imperfections that might otherwise produce ragged edges along the cuts instead of these cleanly defined slices and curls. 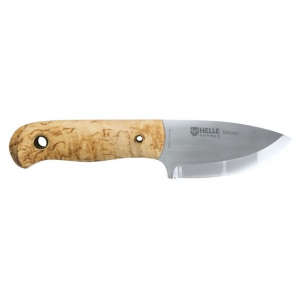 Helle has given much attention to this edge and it shows. 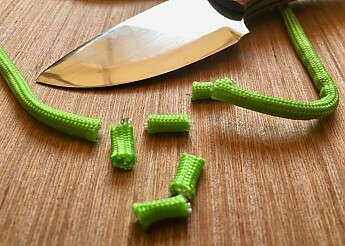 When cutting fibrous materials such as paracord, the Mândra cuts quickly and cleanly. This is true whether one cuts a loop of cordage in the hand or whether one presses the knife through cordage against a hard surface. When batoning the Mândra through small wood stock, it performs adequately—the thinness of the blade and the Scandinavian grind are not the best for splitting wood in this fashion, but it is possible with small stock, a boon if one is preparing kindling for a fire or wood-burning stove. 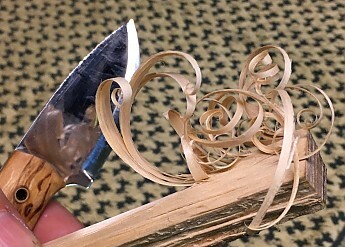 Carving feather sticks for fire preparation is a different matter. Given its Scandinavian grind, the Mândra is essentially a carving tool, and one can slice thin feathers of woods from a stick with ease and with considerable control: fine for flash tinder, thicker to fuel the kindling. Not surprisingly, the Mândra excels at carving notches. 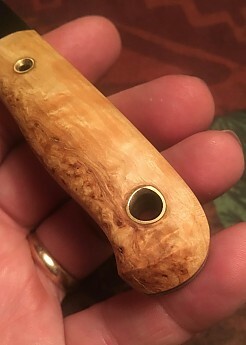 I took loose inspiration from boreal forest survival instructor Mors Kochanski’s “try stick” concept to play around with various types of notches and see how the Mândra did. Although the wide, flat blade is not the best for some notches, where its height inhibits one’s ability to slide down into a rounded notch, for instance, the thinness of the blade and the narrow tip do allow one to accomplish most notching and other precise woodworking tasks with ease. The spine of the Mândra can be used to strike a ferrocerium rod for fire starting, but it is not as sharp as some knives and thus less effective in this capacity. I got it to work, but it required some effort. 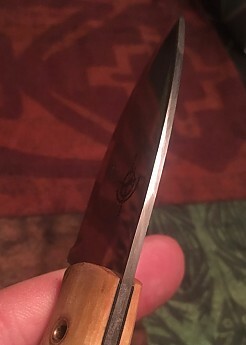 Once I had brutalized the spine with a quartz rock during testing, I smoothed out the nicks and sharpened the spine to a 90˚ angle to allow it to be used more effectively as a scraper, a recommendation I would make for those who use the spine of their knives as a ferrocerium rod striker. In the realm of meat fabrication, the Mândra offers a serviceable option, too. I found it excelled when trimming tendon or fat from meat (it would work well for some hunting or fishing applications). 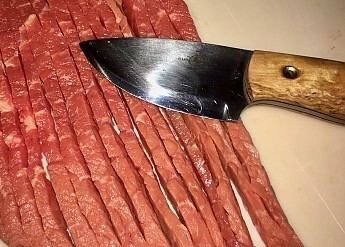 It also sliced meat easily, whether I pressed it through or sawed it through, but the short length of the blade does have limitations. 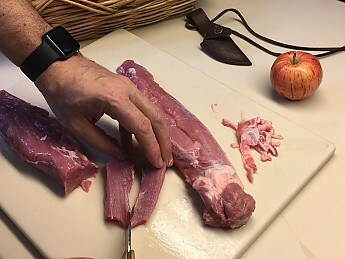 For instance, note the "tail" on the meat I'm holding in the image, above, which was created by the blade not being long enough to slice through all of the meat when blade pressure compressed the tissue. 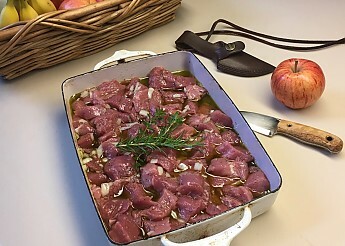 With practice and more of a sawing motion, I was able to overcome this (note cubed meat in marinade, below). 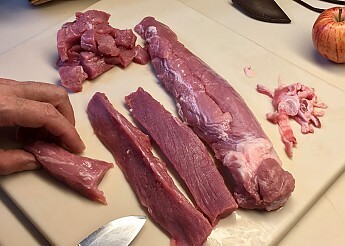 While I was able to process two complete pork tenderloins for a marinade, I did find myself aware of the inefficiency of the knife as I completed the task. It worked, but a longer knife would have worked more efficiently, and the Mândra required a period of acclimation to learn how best to use the blade’s deep belly to accomplish slicing tasks with wider foods. This was particularly evident when I diced an onion for the marinade. 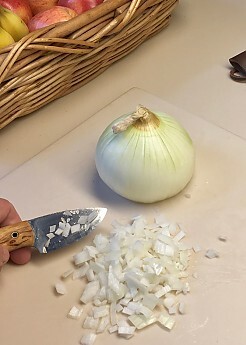 I was able to do it, but only by rotating the large onion in a circle as I gradually cut one portion of the onion at a time. 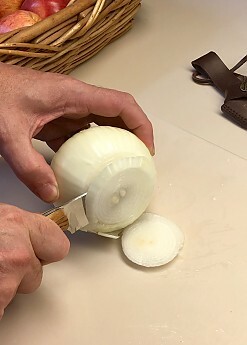 Once through the onion, the Mândra proved to be a better slicer than dicer owing to its blade length, but with a combination of slicing, dicing (rocking the blade), and some patience, I was able to complete the task. 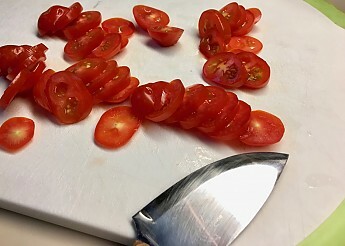 With softer foods such as ripe grape tomatoes, the incredible sharpness of the Mândra proved a boon—I was able to slice these tomatoes for bruschetta with little trouble and no squishing of the tomatoes. Note, however, that the size of these tomatoes made them optimal for use with the Mândra. 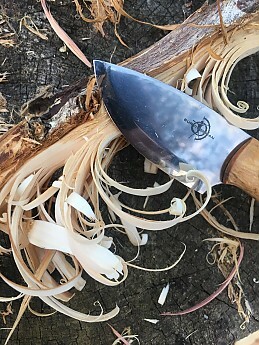 With various food tasks, the handle of the Mândra became wet but never slick: the birch scales allowed me to maintain control, and rinsing them off afterwards (and occasionally rubbing them with boiled linseed oil) kept them in good condition. In general, I found that I really liked having the Mândra handy. It is a light blade that is easily carried, compact but razor sharp, and it was very useful for camp chores or household and yard use. Cordage, wood, meat, Mountain House packages--all sliced neatly beneath the Mândra’s edge. The sheath was an aesthetically pleasing and functional protector and carrier of the knife. Unfortunately, the traditional foldover retention strap poses a problem when removing the knife. 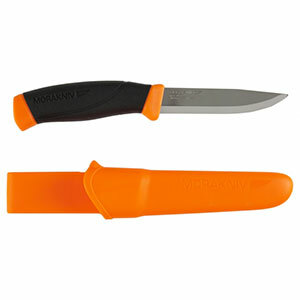 It has a tendency to flop back against the edge of the knife when the blade is inserted or removed. 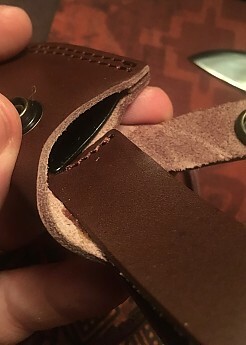 This can cause lacerations in the strap and might result in eventual failure—not good in a knife that rests loosely in its sheath when not secured by the strap. 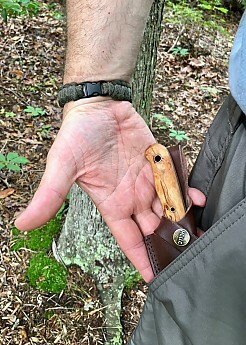 However, with some practice, this tendency can be addressed if one opens the snap and then holds the strap away from the blade with one’s index finger as the knife is removed. In time this becomes second nature. The Mândra essentially allows one to carry a lightweight fixed blade knife that is about the same weight as a moderately sized folding knife. I loved the ease of carrying it around my neck, allowing be to be oblivious to whether or not the pants I was wearing had pockets or whether or not I was wearing a belt. It proved its use in the kitchen with appropriately sized foods but exposed also limitations based on its size. 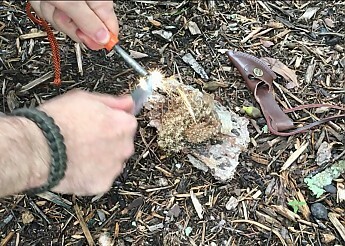 In camp, I liked being able to baton it to split small kindling, too, something I would not usually do with a folding knife. 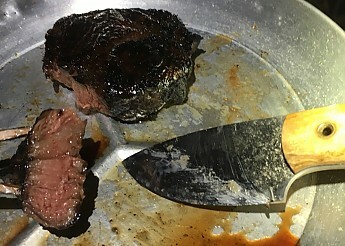 It made a truly elegant backwoods steak knife as well! Notably, I was amazed and delighted by its keen edge every time I used it. The laminated steel is rarely found in a small knife and serves its user well. Helle proudly trumpets the quality of their steel, and I felt that it was justified based on my experience with the Mândra. 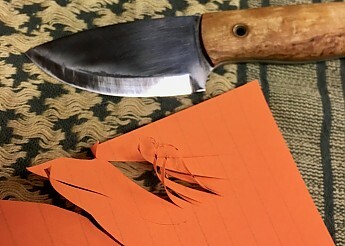 I was also thrilled to find that stropping the knife restored the edge quickly after use: I simply carried a small scrap of leather impregnated with stropping compound on backpacking trips for this purpose. Ease of edge maintenance is a significant boon in the field or on protracted treks. A dull knife, after all, is dead weight. The scale of the Mândra is delicate, and the three-finger grip was at times a minor frustration when I sought greater leverage for a cutting task. To be fair, this occurred when I was pushing the limits of the knife--clearly it is not intended to accomplish the same tasks as larger knives, but those with large hands should consider the three-finger factor (as well as thought with smaller hands, for whom this may be a benefit!). The birch handles and leather sheath merit consideration by prospective buyers. They are gorgeous. Obviously, such materials have been used for generations in Scandinavia, an area that averages 30+ inches of rain a year, so they are also functional and proven. Like all tools, the Mândra and its sheath require care and maintenance. I had no issues with these materials, but I also maintained them. 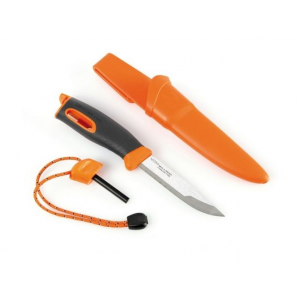 However, a similarly sized neck knife with a plastic handle and sheath (like the more economically priced Mora Eldris) might provide some prospective buyers with an option better suited to their needs or a desire for less maintenance. 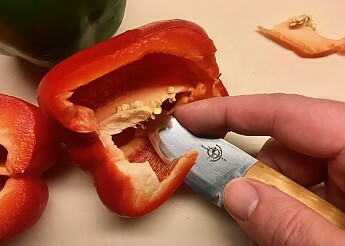 (The Mora trade-off: a less expensive, larger handled, slightly lighter but "plasticky" knife with less expensive, less sharp, and slightly harder to maintain steel). For all that my sample had some aesthetic issues, I loved the rich look of curly birch and leather and steel. The birch deepened in color with use, absorbing the oils of my hand, but this only made it more appealing to me. This is a beautiful design, and if you are one who favors Old World aesthetics over more contemporary designs, you might consider the Mândra (but keep in mind the cosmetic imperfections I’ve mentioned). If you are one seeking a handy fixed blade option for carry on backpacking treks, the Mândra is worthy of your consideration. It is sufficiently small, reasonably light, and definitely functional enough to be worthy of a backpacker’s consideration. Those who process fish or game with small blades will likely enjoy the Mândra’s sharp edge and the ease of maintaining that edge. The knife's size provides one with excellent control. The Mândra is deserving of Helle’s reputation for superb tools when one considers its abilities in a knife this size. While it came with some cosmetic issues, it proved its value as a tool. I’d sum it up in this fashion: it may not live up to your expectations in terms of beauty, but it will in terms of superb and satisfying utility. This held true at home and in the woods, processing wood or processing meat. If the cosmetic quirks I’ve described are not too off-putting, by all means check out the Mândra. Note: The Mândra’s sharp edge is virtually second to none among all the knives I have owned and used. Despite some inherent limitations based on its shape and size, it handles a variety of tasks well. Moreover, it is easily maintained. Ordinarily I would be inclined to rate this knife 4.5 out of 5 stars, withholding the last half star because of the high price. 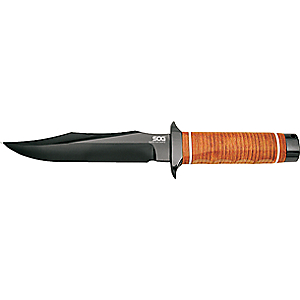 However, this knife comes at a high price with cosmetic issues that, in my opinion, should not appear on knives in this price range. 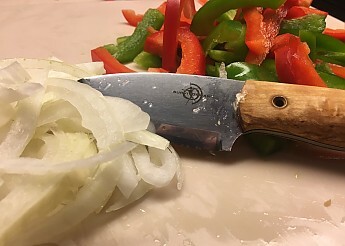 Wishing to acknowledge these imperfections while also acknowledging that they do not affect the utility of the knife, I have rated the Mândra 4 out of 5 stars. Great review, info, and images, Bentbrook! Thanks so much for such thorough and helpful testing and reviewing of this knife. I was hungry after seeing all of those food prep pictures! Never mind the great knife review, I'm coming over for dinner! Thank you, Old Guide and Phil. Phil, I figure you might as well enjoy fueling your body!